the lithosphere, which includes the exposed surface of Earth's crust. The crust is fragmented into tectonic plates that move over the rheic asthenosphere via processes that are referred to collectively as plate tectonics. Geologists employ an unusual quality of imagination in visualizing processes such as the movement of tectonic plates taking place over millions and hundreds of millions of years. Their work in establishing strong evidence for an ancient origin of the earth has been a key factor supporting conventional scientific models in the ongoing skirmishing between science and religion. Geologists help locate and manage the Earth's natural resources, such as petroleum and coal, as well as metals such as iron, copper, and uranium. Additional economic interests include gemstones and many minerals such as asbestos, perlite, mica, phosphates, zeolites, clay, pumice, quartz, and silica, as well as elements such as sulfur, chlorine, and helium. Astrogeology refers to the application of geologic principles to other bodies of the solar system. However, specialized terms such as selenology (studies of the Moon), areology (of Mars), are also in use. The word "geology" was first used by Jean-André Deluc in the year 1778 and introduced as a fixed term by Horace-Benedict de Saussure in the year 1779. An older meaning of the word was first used by Richard de Bury. He used it to distinguish between earthly and theological jurisprudence. In China, the polymath Shen Kua (1031–1095) formulated a hypothesis for the process of land formation: based on his observation of fossil shells in a geological stratum in a mountain hundreds of miles from the ocean, he inferred that the land was formed by erosion of the mountains and by silt deposits. In the western world, the work on rocks Peri lithōn by Theophrastus, a student of Aristotle, remained authoritative for nearly two millennia, its interpretation of fossils remaining in place until after the Scientific Revolution. Peri lithōn was translated into Latin and the other languages of Europe such as French. Georg Bauer (Georg Agricola (1494–1555)), a physician, summarized the knowledge of mining and metallurgy in a book, De re metallica libri XII and its appendix Buch von den Lebewesen unter Tage (Book of the Creatures beneath the Earth), which was published in 1556. It was the first systematic treatise about mining and smelting works and included such diverse topics as wind energy, hydrodynamic power, melting cookers, transport of ores, extraction of soda, sulfur, and alum, and administrative issues. By the 1700s, Jean-Etienne Guettard and Nicolas Desmarest hiked central France and recorded their observations on geological maps; Guettard recorded the first observation of the volcanic origins of that part of France. William Smith (1769–1839) drew some of the first geological maps and began the process of ordering rock strata (layers) by examining the fossils contained in them. James Hutton is often viewed as the first modern geologist. In 1785, he presented a paper entitled Theory of the Earth to the Royal Society of Edinburgh. In his paper, he explained his theory that the Earth must be much older than had previously been supposed in order to allow enough time for mountains to be eroded and for sediment to form new rocks at the bottom of the sea, which in turn were raised up to become dry land. Followers of Hutton were known as Plutonists because they believed that some rocks were formed by vulcanism which is the deposition of lava from volcanoes, as opposed to the Neptunists, who believed that all rocks had settled out of a large ocean whose level gradually dropped over time. In 1811, Georges Cuvier and Alexandre Brongniart published their explanation of the antiquity of the Earth, inspired by Cuvier's discovery of fossil elephant bones in Paris. To prove this, they formulated the principle of stratigraphic succession of the layers of the earth. They were independently anticipated by William Smith's stratigraphic studies on England and Scotland. Sir Charles Lyell first published his famous book, Principles of Geology, in 1830 and continued to publish new revisions until he died in 1875. He successfully promoted the doctrine of uniformitarianism, which states that slow geological processes have occurred throughout the Earth's history and are still occurring today. In contrast, catastrophism is the theory that Earth's features formed in single, catastrophic events and remained unchanged thereafter. Though Hutton believed in uniformitarianism, the idea was not widely accepted at the time. By 1827, Charles Lyell's Principles of Geology reiterated Hutton's uniformitarianism, which influenced the thought of Charles Darwin. Nineteenth-century geology revolved around the question of the Earth's exact age. Estimates varied from a few hundred thousands to billions of years. The most significant advance in twentieth-century geology has been the development of the theory of plate tectonics in the 1960s. Plate tectonic theory arose out of two separate geological observations: seafloor spreading and continental drift. The theory revolutionized the Earth sciences. 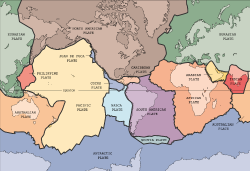 The theory of continental drift was proposed by Alfred Wegener in 1912 and by Arthur Holmes, but wasn't broadly accepted until the 1960s when the theory of plate tectonics was developed. There are a number of important principles in geology. Many of these involve the ability to provide the relative ages of strata or the manner in which they were formed. The Principle of Intrusive Relationships concerns crosscutting intrusions. In geology, when an igneous intrusion cuts across a formation of sedimentary rock, it can be determined that the igneous intrusion is younger than the sedimentary rock. There are a number of different types of intrusions, including stocks, laccoliths, batholiths, sills, and dikes. The Principle of Cross-cutting Relationships pertains to the formation of faults and the age of the sequences through which they cut. Faults are younger than the rocks they cut; accordingly, if a fault is found that penetrates some formations but not those on top of it, then the formations that were cut are older than the fault, and the ones that are not cut must be younger than the fault. Finding the key bed in these situations may help determine whether the fault is a normal fault or a thrust fault. The Principle of Inclusions and Components states that with sedimentary rocks, if inclusions (or clasts) are found in a formation, then the inclusions must be older than the formation that contains them. For example, in sedimentary rocks, it is common for gravel from an older formation to be ripped up and included in a newer layer. A similar situation with igneous rocks occurs when xenoliths are found. These foreign bodies are picked up as magma or lava flows, and are incorporated later to cool in the matrix. As a result, xenoliths are older than the rock which contains them. The Principle of Uniformitarianism states that the geologic processes observed in operation that modify the Earth's crust at present have worked in much the same way over geologic time. A fundamental principle of geology advanced by the eighteenth-century Scottish physician and geologist James Hutton is that "The Present is the Key to the Past." In Hutton's words: "the past history of our globe must be explained by what can be seen to be happening now." The Principle of Original Horizontality states the deposition of sediments occurs as essentially horizontal beds. Observation of modern marine and nonmarine sediments in a wide variety of environments supports this generalization (although cross-bedding is inclined, the overall orientation of cross-bedded units is horizontal). The Principle of Superposition states a sedimentary rock layer in a tectonically undisturbed sequence is younger than the one beneath it and older than the one above it. Logically a younger layer cannot slip beneath a layer previously deposited. This principle allows sedimentary layers to be viewed as a form of vertical time line, a partial or complete record of the time elapsed from deposition of the lowest layer to deposition of the highest bed. The Principle of Faunal Succession is based on the appearance of fossils in sedimentary rocks. As organisms exist at the same time period throughout the world, their presence or (sometimes) absence may be used to provide a relative age of the formations in which they are found. Based on principles laid out by William Smith almost a hundred years before the publication of Charles Darwin's theory of evolution, the principles of succession were developed independently of evolutionary thought. The principle becomes quite complex, however, given the uncertainties of fossilization, the localization of fossil types due to lateral changes in habitat (facies change in sedimentary strata), and that not all fossils may be found globally at the same time. This page was last modified on 6 March 2017, at 23:58.